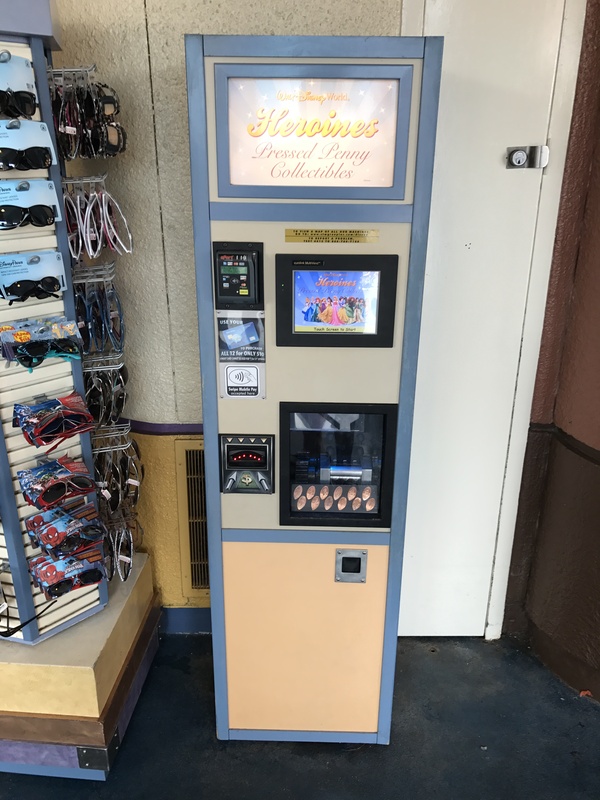 Last year (2015) I had written about my family vacation to the Walt Disney World resorts and even had a special post about a new milt-design machine that had just been made available. At the time this was a first of its kind offering 12 designs all in one place. You can read out my experience with it here. This year we went back for a Wedding and obviously took some of our spare time to enjoy the parks. 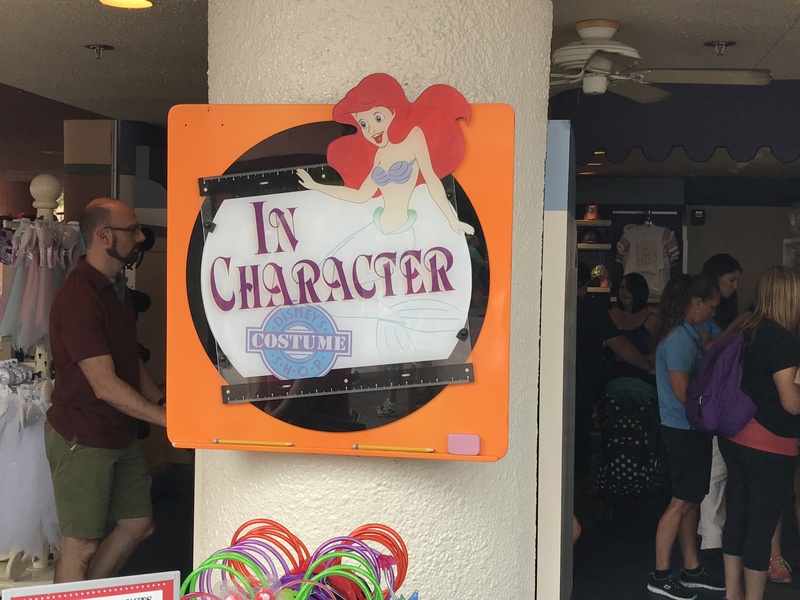 On the day we visited Hollywood Studios I stopped back at the In Character Shop to see if the machine was still there and press another set. When the coins dropped out I was taken back a bit. 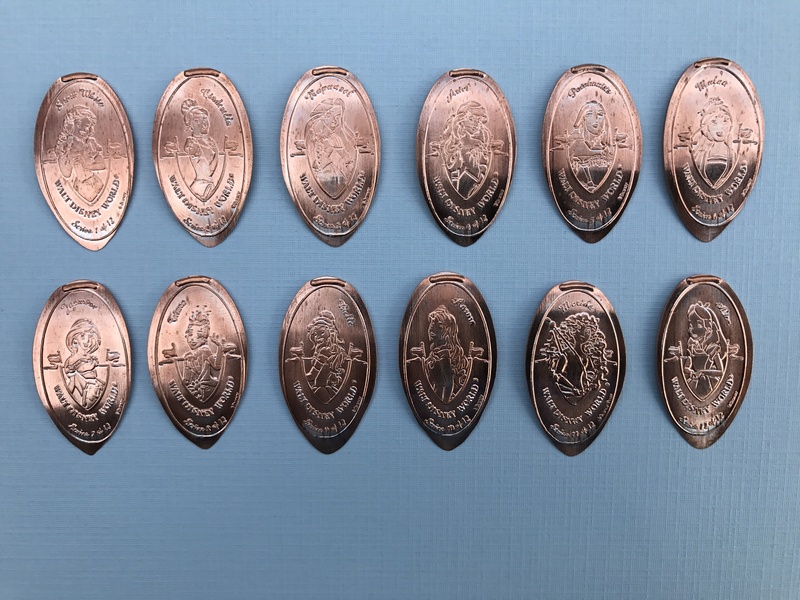 My recollection of the first set I had pressed in 2015 was that the pre-loaded pennies were not the greatest and resulted in terrible final results. This year (2016) however the coins that dropped out were much nicer. I wanted to take this opportunity to compare the two and let you see the vast difference. First up is just a glance at the fancy machine. The cabinet has not changed since the previous year. As far I know this is still the only machine that offers 12 designs. There are quite a few of these multi-design machines now available but they all have stopped at 8 designs. 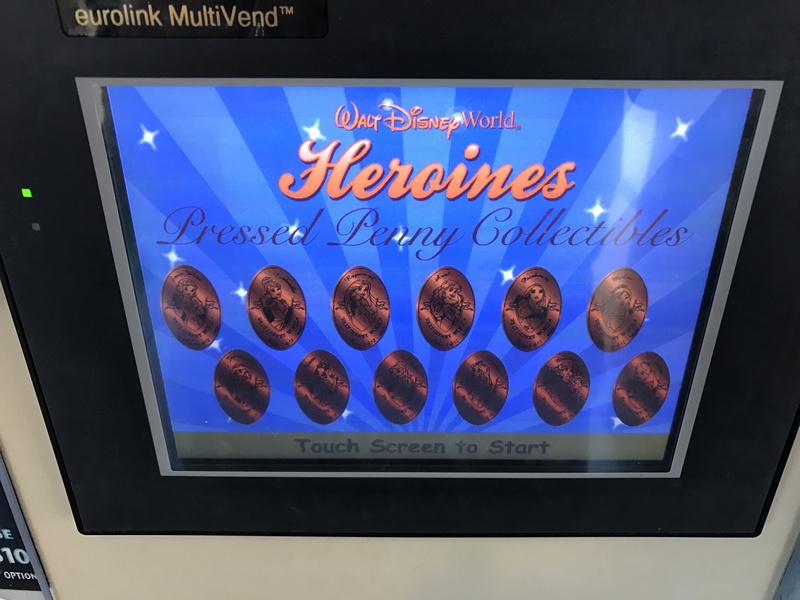 The designs at this machine are a numbered series as part of the Heroines collection. Pictured above is the set I had collected back in 2015. 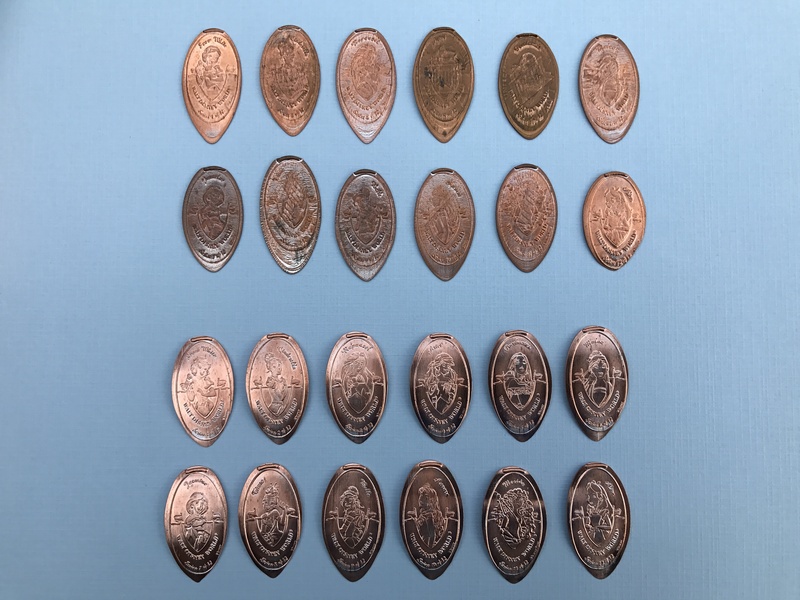 As you can see many of the coins are tarnished, and almost impossible to see what the actually pressed image is supposed to be. A couple of them I was only able to figure out due to the process of elimination. Now shown above is the set I just collected a few weeks ago in 2016. These are much brighter, shinier, and the pressed designs came out much better. I tried to get all of them in one shot. 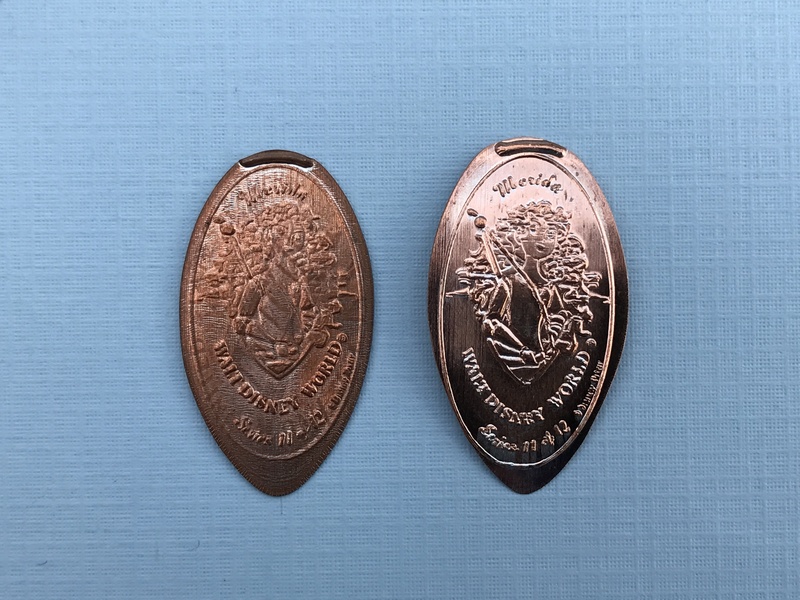 The 2015 coins are on the top and the 2016 at the bottom. You can see there is definitely a difference between them. Another few close up examples. This image shows Tiana from Princess and the Front. Left is the 2015 press, and the right is 2016. This example shows Merida from the movie Brave. 2015 is on the left and 2016 on the right. Initially when I used the machine in 2015 I was a little disappointed that I couldn’t supply my own coins. As a pretty serious collector I always like to use pre-1982 pennies which I have written about before. 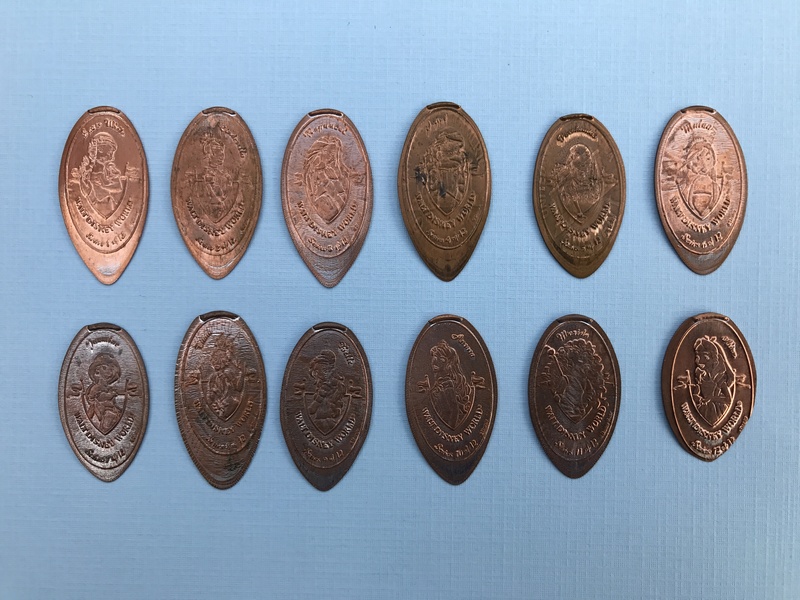 These are the coins that actually had a larger amount of copper in the coins as opposed to post-1982 coins which are mostly zinc with a thin coating of copper. 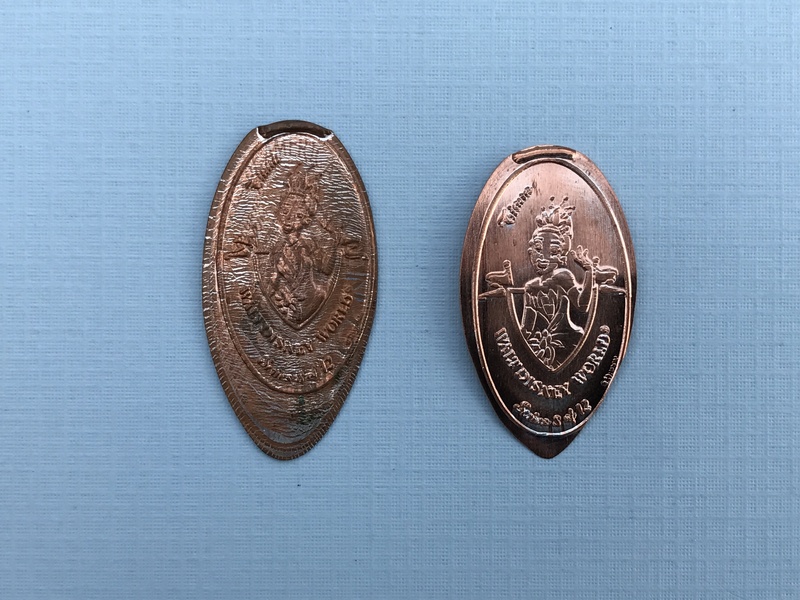 The older coins result in a much better final product, versus the newer zinc coins can have some stretching which distorts the designs. But thinking about how these new multi-design machines work it does seem like it may be difficult or take way to long to give the user the ability to supply their own coins in this quantity. I do wish that they had used some nicer pennies back in 2015 just due to the poor final results I had and I’m sure many other people had at that time, but I’m sure that would obviously increase the production cost and most users may not necessarily be as concerned. I have noticed over the last year since using this machine, many more of these multi-design machines have popped up and each of them now seem to use a blank token instead of pennies. But hopefully from the comparisons above you can see that these tokens, even though not my first choice, are at least a better option than what was initially tried in these machines.